Located in the northern part of Karnataka, Gulbarga, also known as Kalaburagi, is a historical place which is known amongst tourists for its ancient places, such as temples, mosques and forts. If you are a history enthusiast and are looking for a place from Hyderabad where you can savour the beauty of centuries-old historical sites, then you must plan a tour of Gulbarga. It has a history stretching back to the period when the region was under the rule of the Chalukya dynasty. Later on, it was controlled by several other dynasties, such as the Rashtrakutas, the Kalachuris, the Hoysalas and the Mughals, until it was captured by the Nizams of Hyderabad and formed a part of the Hyderabad State. Today, this ancient marvel is one of the significant districts in Karnataka and is visited by thousands of tourists every year. If you are looking for such weekend destinations, then read on to know more about Gulbarga and its incredible attractions. Gulbarga lies in a belt that experiences hot summers, and therefore it is a less-preferred destination during the summer season. However, for history lovers and other travellers, it is a year-round destination. If you are looking forward to avoiding the summer heat, then the best time to visit Gulbarga is from October until the end of March. By Air: Gulbarga doesn't have an airport of its own and the nearest airport is located in Hyderabad. Therefore, there is no option available for travelling by air if you are starting your journey at Hyderabad. By Rail: Gulbarga is well connected to all other cities and towns by rail. You can catch a direct train from Hyderabad to Gulbarga and it will take an approximate time of 4 h to reach the destination. By Road: Gulbarga has a well-maintained road system and is easily accessible by road. One can either hire a cab or catch a direct bus to Gulbarga from Hyderabad. On your way, you can take a break at Zaheerabad and witness its beautiful attractions. Located in the Medak district of Telangana, Zaheerabad isn't a proper tourist destination. However, on account of the presence of several religious sites and a few ancient places, it makes for a perfect en route destination. It is situated at a distance of about 114 km from Hyderabad and 118 km from Gulbarga. The major places to explore here include Jamia Masjid, Sri Ketaki Sangameswara Temple, Green Mosque, Shivalayam Temple, Ayappa Temple and Methodist Church. Gulbarga is located at a distance of around 232 km from Hyderabad and deserves to be visited by every history lover. After all, it harbours places that can teach you a lot about the bygone era of India. Following is the list of the major places in Gulbarga which shouldn't be missed by any traveller. A beautiful Buddhist complex, Buddha Vihar is a spiritual centre which is mainly visited by tourists looking forward to savouring a peaceful and serene environment. Even though it is a newly built structure and was constructed in the year 2007, it is one of the most frequented places in Gulbarga. On account of its beautiful architecture, it has become quite popular amongst architecture enthusiasts too. The structural formation of the complex is inspired from the Buddhist centres in Sanchi, Sarnath and Ajanta. The exact history of Gulbarga Fort is still unknown; however, it is said to have been established during the Chalukya dynasty. Today, the fort is lying in ruins and one can only witness its ruined walls and other destroyed monuments. The renovated Jami Masjid and Tomb of Khaja Bande Nawaz are the major places one can explore within the fort. If you are looking forward to learning about the history of Gulbarga, then you are bound to explore Gulbarga Fort. Haft Gumbad is a beautiful complex which houses seven domes. 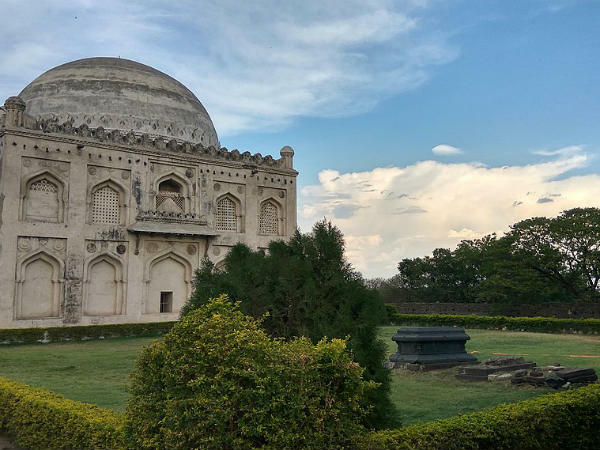 These domes are surrounded by a beautiful garden and lush greenery; therefore, Haft Gumbad makes for a beautiful picnic spot in Gulbarga. How about getting yourself to these architecturally built marvels and capturing their beauty on your camera? One of the most frequented shrines in Gulbarga, Sharana Basaveshwara Temple is a religious site which is dedicated to a Lingayat saint, Sharana Basaveshwara, who lived in the 18th century. The temple houses a small lake which helps in maintaining a peaceful and calm environment. If you think the above-given list is not enough to satisfy your wanderlust, then you can make a tour of other beautiful places in Gulbarga. These lesser-known sites include Koranti Hanuman Temple, Shri Ram Mandir, Basavanna Temple and Shor Gumbad.